So whats the challenge? 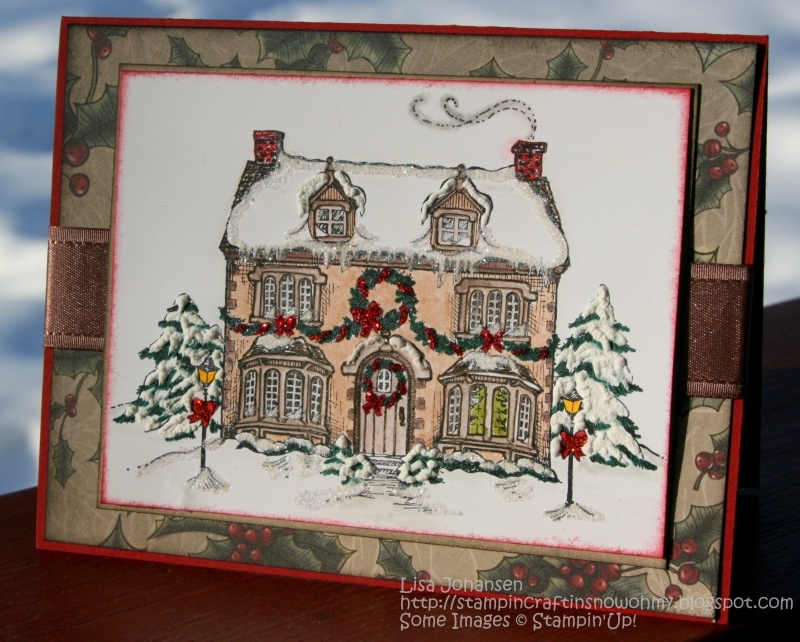 It was "Home For the Holidays" and the challenge is to make a card that reminds you of Christmases past. I grew up in Massachusetts until I was 12 and New England will always hold a special place in my heart. 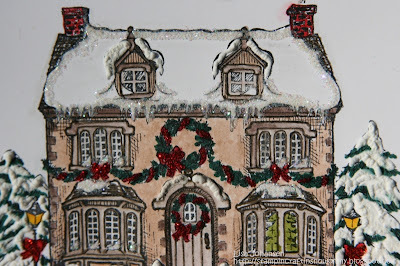 I loved seeing all the old Colonial homes decorated for Christmas and sparkling in the cold winters night. Therefore with this challenge I brought out an old stamp of mine that is one of my favorites. It just really reminds me of Christmas in New England. As always, thanks for taking the time to stop by, I appreciate it!! You can also click on the pictures for a larger version! 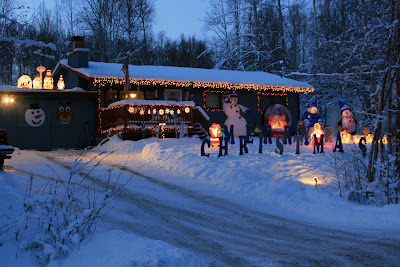 And this was my house this past Christmas. Because of my fathers passing I didnt decorate as much as I normally do! 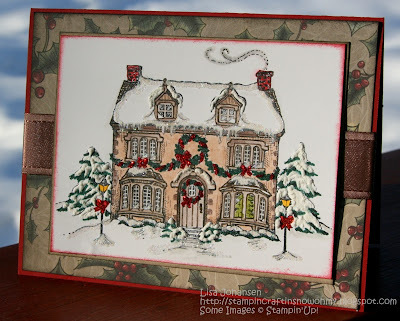 Cherish those memories ... they will always be with you ... love that classically decorated home ... so very pretty ... thanks for joining our jingle belles journey. so sorry for your loss, what wonderful memories!!! i LOVE this style of home and when hubby and i were back east (in the summer of course) i must have taken over 100 photos of houses!! just don't see them on the west coast. This card is so pretty! I love the way you have coloured the adorable house. Thanks for playing along with the CSAYL challenge this week! Oh Lisa I am so very sorry for your loss. After reading this post I can only say that you are such a strong person. Thank you for sharing your story with all of us. 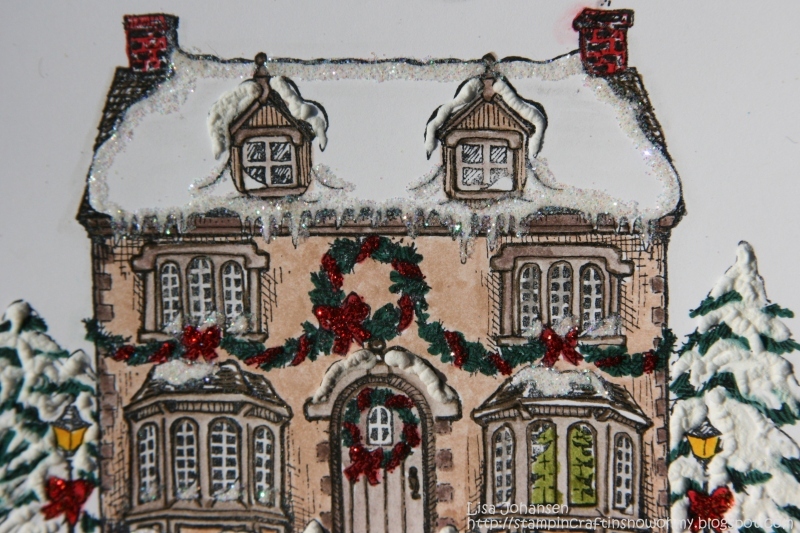 Your card is so pretty and I love all the sparkles you added. I also love how beautiful your house looks with the lights, decorations and snow!! Thanks so much for joining us at CSAYL!! wow wow wow your card is gorgeous! TFS! Abeautiful Creation! Very 3D! I could just reach out and grab an icicle hanging from the roof! Well done! A wonderful way to remember! Good luck at CSAYL! It is never easy to celebrate after a profound loss and the heart eventually is able to find the joy of their memory. Your card celebrates the warmth of your family and it is oh so clear how deep and great the love is among your family members. This card is perfect! Lovely card you made for our challenges.Thanks for playing with us at CSAYL.